Special thanks to Swoon Reads and NetGalley for providing me with an advance copy of the book for review! Uh, fake relationship that turns into more? Count me in! I’ve had pretty good luck with Swoon Reads’ titles, and No Love Allowed was no exception. It’s the perfect book to get you in the spirit of summer. Light, fun, and adorable! The whole story starts after a crazy proposition and a spontaneous decision are made: Caleb asks Didi to be his fake girlfriend, and she accepts. While the general storyline was a little predictable and cliche, I liked this book for its characters, particularly Didi. She was a little spunky, and a lot likable! One of my favorite things about her was that she was relatable to me in that she’s an artist, a painter to be exact. I enjoyed that her love of painting actually played a role in the story and in shaping her character, instead of just being a hobby of hers. I don’t think I’m spoiling you by saying that Didi and Caleb totally fall for each other (*cough* predictability). As I mentioned before, I found their relationship to be the predictable part of the story. They were really cute together, though. Didi and Caleb were masters at flirting and banter! There were aspects of the book that caught me by surprise, such as Didi’s mental illnesses. I enjoyed the incorporation of the more serious storyline into an overall lighthearted book. Yes, it was cliche (the whole fake relationship, Caleb being mega-rich and Didi being pretty poor), but it’s a fun and super cute story! 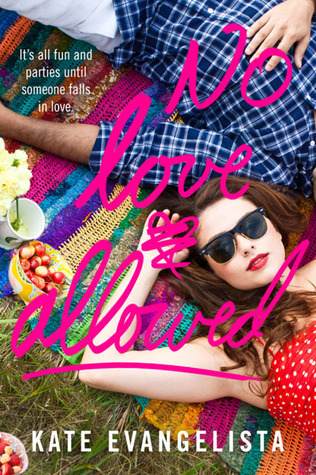 Perfect for a quick summer read, No Love Allowed is a romance that will make you smile. Special thanks to Entangled: Teen for providing an advance copy for review! Love and Other Unknown Variables is yet another story featuring a disease, but isn’t a book that focuses on disease at all. It is a cute and heartfelt story of first love, and all of the unknown things that go along with it. At first I wasn’t a huge fan of the main character, Charlie. He’s incredibly smart, except when it comes to girls. But as the story continues you really get to know him and love him for his quirks. And then there’s Charlotte — the pretty, snarky, and funny girl that steals his heart from the moment he meets her. Their love story is cute, and you can’t help but enjoy reading it. It’s uniquely told from Charlie’s POV, so unlike in many contemporaries, we get to see inside the guy’s mind, instead of the girls, which I really ended up liking. And yes, there is a disease in this book. But, again like I’ve mentioned in other reviews, Love and Other Unknown Variables is unique, and doesn’t focus on the sadness, but life itself. 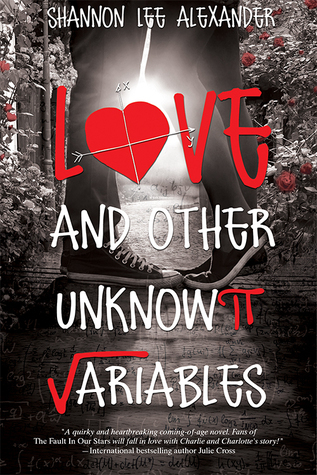 All in all, Love and Other Unknown Variables was an adorable read that will be sure to fill your heart with warmth!